VISIT OUR WEBSITE! CALL US FOR A QUOTE AND AVAILABILITY. 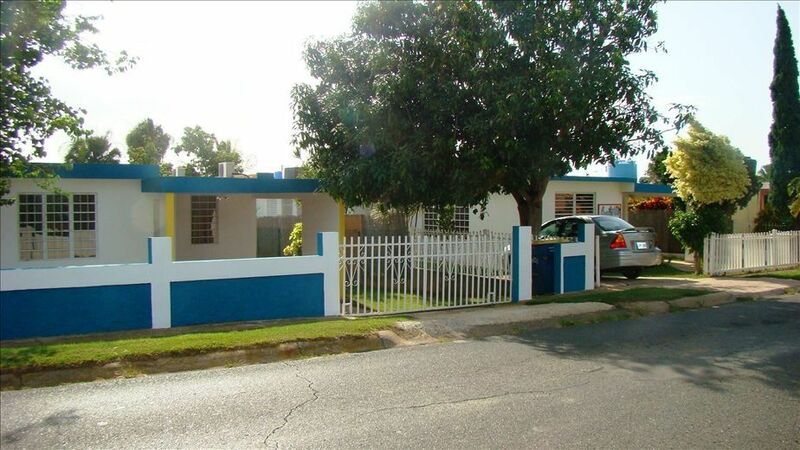 Villa Caribe is an expansion of Casa Caribe Vacation Rentals, located on the former Ramey Air Force Base in Punta Borinquen, the northwest tip of Puerto Rico. Services available through our network: transportation to and from airports, sightseeing tours, surf tours and lessons, surfboard rentals, diving trips and instruction, car rentals, and adventure tours. Our property sleeps 6-8 guests. Great for large families or small groups. Villa Caribe is conveniently located. It can be your family's home away from home. Just hop on a plane, bring your personal belongings, and stay in Villa Caribe. Travel to beautiful nearby beaches, relax in the sun, enjoy natural beauty, enjoy the Puerto Rican hospitality and culture, and have fun while staying in the comfort of Villa Caribe. Activities include sun bathing and swimming at nearby beaches, surfing at nearby world class surfing spots, playing tennis, bicycling in the neighborhood, horse back riding, diving, kite surfing, and snorkeling. Other activities include visiting or playing at the 18-hole Punta Borinquen Golf Courses, President Eisenhower's favorite, literally located at the northwest tip of Puerto Rico on a plateau overlooking the Caribbean Sea or enjoying the ramps at the nearby skatepark. Hablamos espanol. Llamenos para precio y disponibilidad. We have spent part of our lives on the island and enjoy the time we continue to spend every year. We enjoy the neighborhood with its proximity to world class surfing spots and beaches. The location allows us to enjoy tranquility with plenty of R&R as we continue with our every day jobs. Enjoy the produce from the fruit trees in the yard. Try the juicy jobos and gandules (pigeon peas) during the winter months, the guineos (bananas) throughout the year; the aguacates (avocados) and mangos (mangoes) in the summer. Beach bags, folding chairs, cooler, 130 cable channels, and internet available for your laptop. Coin-operated laundry. Centrally located. My fiancé, my sister and myself rented this apartment for a short stay - 3 nights, and I have to say that the experience was fantastic. Although it was an emergency visit to Puerto Rico due to a death in my family, the stay at Villa Caribe made the circumstances much easier. It's a beautiful home, clean, quiet area, so comfortable, plus Allyn, Ivette and Carlos were great. Really kind souls and very easy. I highly recommend this rental! My fiance and I rented Villa Caribe for two nights. It's a beautiful 2 bedroom house with a very comfortable living room and dining room. The kitchen is quite big. The minute we walked in we fell in love with it. The house was perfect. The area (nearby beaches if you want to surf or scuba dive) and a great neighborhood - very quiet), the size of the house is very very comfortable, the decor was great, the backyard, etc... The house has more than what we needed and then some. You can tell that they thought of everything when putting this rental together. The maintenance is unbelievable to be a rental and is very clean. It actually looks and feels like a home. They had in stock everything and anything that you needed. We have rented before from Casa Caribe but not this house (the one next door) which you can't go wrong either. Just that this time around we were going we another couple so we needed more room. Let me tell you, you will not be disappointed. We all loved it and had a great time. It didn't feel like your typical "rental unit". We were also very please with the communication and response we had with Ivette and Allyn. They are always very professional and very easy to get a hold off, easy going. I highly recommend their rental. Overall it was perfect! We hope that you were able to enjoy some of the fruits from the yard. Thank you for your repeated business. We hope to see you again soon. The house matched the description and pictures. Nice ventilation from the strong breezes in the living areas with windows open and ceiling fans. Glad for A/C in the bedroom at night. Carlos, the manager, provided excellent service, meeting us at the property to show us around and to make the minor needed repairs when necessary. The wifi was fast and reliable. Not too many channels available for English speakers on the cable TV. This house is located just a short distance away from the Aguadilla Airport. And while this is convenient for travelers arriving by air, it makes for a noisy stay since many flights arrive and land in the very early hours of the morning (4-6 am). The property is quite convenient to restaurants, golf and beaches. The owners responded quickly to any issues we had. Don't expect to find luxury here, but the value was good for the price. We have stayed at Casa Caribe 5 times now. Very convenient to the airport. Nice property. Super cool landlord. Carlos, the property manager, is very helpful and is always got everything ready for us. Very reasonable pricing. We'll be back for years to come! It is pleasure to have guests such as you and your group who enjoy the facilities, the neighborhood, and the wonderful surfing beaches nearby. See you again on your next surf trip.